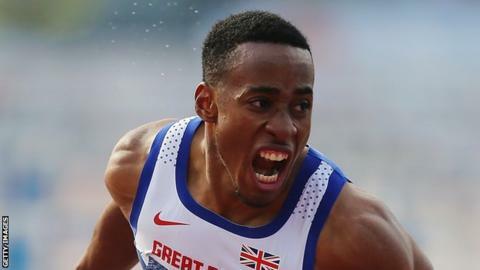 Welsh hurdler David Omoregie says he is aiming to reach Colin Jackson's level as he prepares for the European Indoor Championships. The 21-year-old will compete in the 60m hurdles after he was included in the Great Britain squad for the trip to Belgrade, Serbia on Friday. "Colin was an incredible athlete, all you have to do is look at the medals he won in his career," Omoregie said. "I'm going to keep progressing and see where I go, really." Omoregie told BBC Radio Wales: "I am not Colin Jackson but he is a good role model for me with the fact that he is the same stature as myself. "I have ran pretty close to the senior hurdle times he ran as a junior so for me it's always a target and if I can get there and get to the level Colin achieved, then that will be amazing." Jackson held the world 110 metres record for a decade and he still holds the 60 metres hurdles record of 7.30 sec. After running a personal best time of 7.63 seconds in the 60m hurdles twice this season, Omoregie is looking forward to competing in the European Indoor Championships. "The hurdles are a very competitive event and there are 10 athletes who have gone sub 7.6 seconds which is a very good level in terms of the European Championships," he said. "For me, I'm just going to go out there enjoy the experience and hopefully try and execute a good race and put myself in a good position to compete out there." Omoregie revealed he has his own motivation for qualifying for the 2017 Athletics World Championships in London as the outdoor season approaches after just failing to qualify for the Olympics last summer. "Missing out on Rio last year has motivated me and I'm really desperate so I'm going to do everything I can in my power to try and get myself on the team [for the 2017 World Championships]," he added. "It's such a great opportunity to compete at a home championships, I don't know how many times you can get that as an athlete so I want to put myself in the best position to get there."